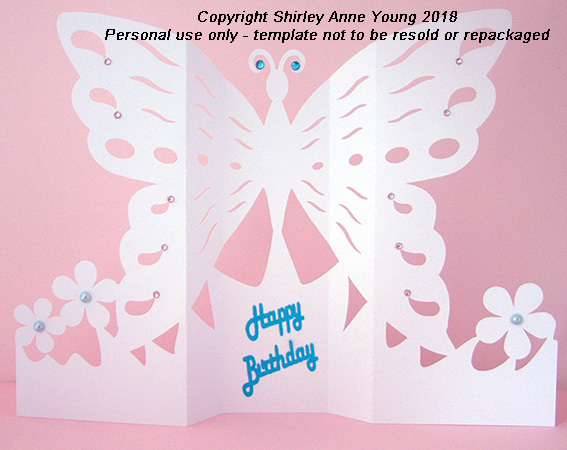 Thanks Shirley - love butterflies. Have a great vacation. Very beautiful and clever. Thank you and enjoy your vacation! I needed a special anniversary card and this is perfect. Thank you. Herzlichen Dank für die wundervolle Datei. Thank you very much ! Have a nice holiday. Another clever and beautiful design Shirley, thank you. Hope you have a wonderful time in that lovely part of the country. Thank you, this looks very interesting... My imagination is fired up! So in love with your beautiful designs!! Merci beaucoup pour cette magnifique carte papillon. Je vous souhaite d'excellentes vacances. Thanks for the file. it is very unusual. with regard to the kittens, we always sent ours to the cattery and had problems after. they showed off and would't talk to us for ages or weed inside which showed they were upset. We found people to visit and feed and cuddle them twice a day. There are a lot of companies near me and hopefully near you. It works out cheaper and our girls seem to prefer it too.No more showing off whn we return. Thank you again Shirley.....always beautiful! Thank you for the beautiful butterfly card. That is really cool how you designed it to close and open. Yes Shirley. I agree that I still wish to receive blog posts from you.